Anjar is one of the unique places in Lebanon that can not be compared with any sight or landmark in the country. It offers the ruins of an ancient city which is a unique testimony to a city built under the Umayyad in the 8th century. The ancient city of Anjar stands in the Bekaa Valley in western Lebanon. Its name literally means - running river. The place is locally known as Haoush Mousa. Currently Anjar's population is around 2400, consisting mainly of Armenians. In 1939 the town was inhabited by several thousand Armenian refugees from the Turkish province of Musa Dagh. Located 58 km from Beirut, the archaeological heritage of Anjar has no parallel with any other historical monument in the country. Most of them are overlays of one another from different historical periods, while Anjar is an outstanding model of a single epoch. Although relatively late in creation - in the 8th century, Anjar has no history like other ancient cities such as Babylon, but still has managed to prosper for several decades. Here you can see the mosque of Baalbek and there are many ruins that tell the history of the Umayyad state. 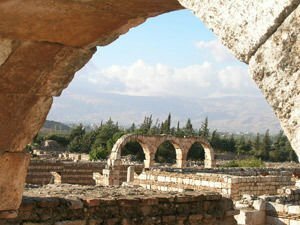 Founded between 705-715 AD, Anjar quickly became an important commercial crossroads. Taking advantage of its strategic location was for the important of trade routes leading to Damascus, Homs, Baalbek and the south. Anjar remained forever unique with the only historic example of an internal mall. It had great importance and was close to the Litani River City, which was an important water source. Excavations in Anjar began shortly after Lebanon gained independence in 1943. The fortified city was surrounded by walls and accompanied by 40 towers, adjacent were planted evergreen cypresses and eucalyptus, which now form a nice park around the city. Anjar is remarkable for its unique city plan, with streets, exquisite colonnades and arches. To date, almost all of Anjar has been excavated and some monuments have been restored. Among the major attractions at Anjar is a palace located in the northwestern part of the archaeological complex, another palace and public baths. Anjar was included in the list of World Heritage Sites by UNESCO in 1984. The palace of the Umayyads, is still quite well preserved, as it can be seen in 3 levels with many Roman sculptures with interesting ornaments. Anjar is a popular tourist destination. Near the ruins of the old town are many nice restaurants where visitors can try local Lebanese and Armenian specialties and many delicious fish dishes.